The Cape southeaster wind played havoc with scoring in the opening round of the Investec South African Women’s Open at Westlake Golf Club today, with only two players, both Europeans, in the 126-player field producing sub-par rounds. Lina Boqvist (pictured above) from Sweden and Austrian Sarah Schober made the most of an early start to set an uncontested clubhouse target with rounds of one-under 71. The afternoon field was in for particular punishment from the wind, which gusted over 50 kilometres per hour at times. Best placed among the late starters were Scotland’s Carly Booth and South African Stacy Bregman, who posted battling scores of two-over 74. 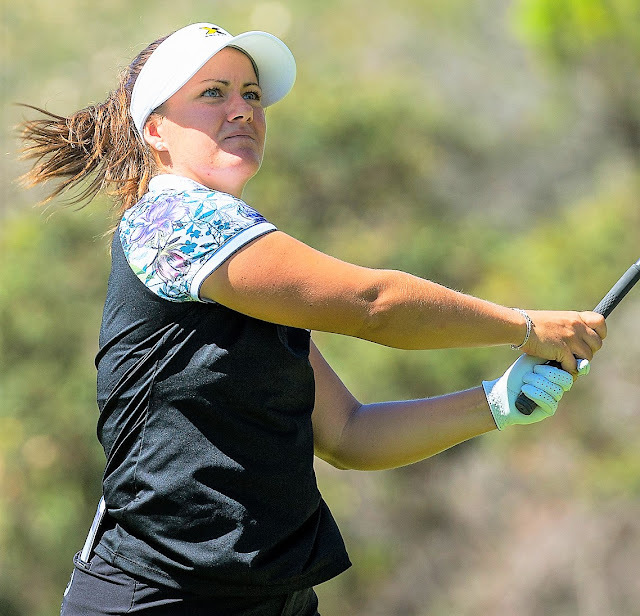 “It was really blowing out there,” exclaimed Kim Williams, a three-time former Sunshine Ladies Tour winner after a wild round that featured just three pars. The Pretoria golfer got off to a great start and held the outright lead at three-under midway. Williams eventually signed for a four-over 76, which was good enough for a share of 22nd. Boqvist, who claimed a top-10 finish here last year, has started her season well and sits 18th on the Ladies European Tour (LET) Order of Merit. “It’s been a long stretch away from home,” she said of a five-week spell that has taken her from her native Sweden to Abu Dhabi, across Australia and finally to Cape Town. Austria’s Schober mixed three birdies with two bogeys and managed to get into the clubhouse before the worst of the wind hit. “Conditions were really tough out there,” she explained. “Off the tee it’s quite narrow and the holes that play into the wind can be very long. Scots Kelsey Macdonald and Michele Thomson were T6 with 73s at the end of the opening day. Hannah McCook and Laura Murray had 76s for a share of 22nd place. Kylie Henry is down in T48 position after a 79. Former top ranked South African amateur Kajal Mistry continued her fine run of form with a one-over-par 73 to grab a share of sixth. More importantly for her, the GolfRSA Elite Squad player boosted her chances to make a run for the Investec Property Fund Order of Merit prize. Mistry currently second sits in third position, behind only Nobuhle Dlamini in the lead and less than 100 points behind Lejan Lewthwaite. Dlamini from Swaziland, who won the sixth edition of the Dimension Data Ladies Challenge, carded 80, while SA Women’s Masters champion Lewthwaite signed for a battling 82. Defending champion Ashleigh Buhai opened with 75, but will take comfort from the fact that she finished only four shots off the lead. The three-time champion failed to take advantage of the early start or the par fives and will need a better second round to get herself into contention for successive victories at Westlake.